As a teacher, it's hard to get students to write quality essays. You're sure you've been clear about how to do the assignment and gone over the requirements time and time again. And then publishing day comes and a pile of terrible essays lands on your desk which you now have to suffer through grading. "Where did I go wrong? Why are my students so incapable?!" you wonder. Now, there is no "quick-fix" for this situation. 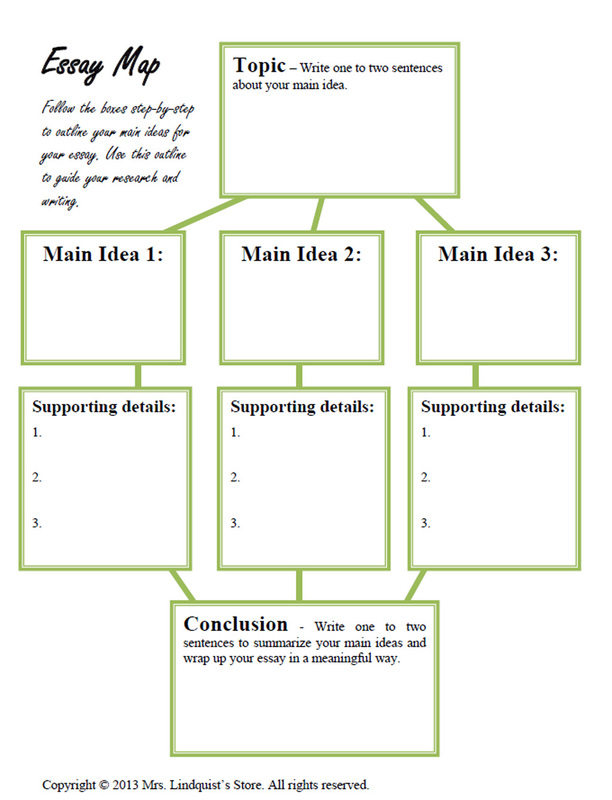 However, I have developed some helpful tools that help guide students through the process of writing. Something as simple as an outline can make all the difference for those writers who just don't know how to put their thoughts together. Plus, it's much easier to see that a student has poor organization in an outline and help them fix it than it is to wait until the end before realizing a student simply didn't get it. Believe me, we've all been there! 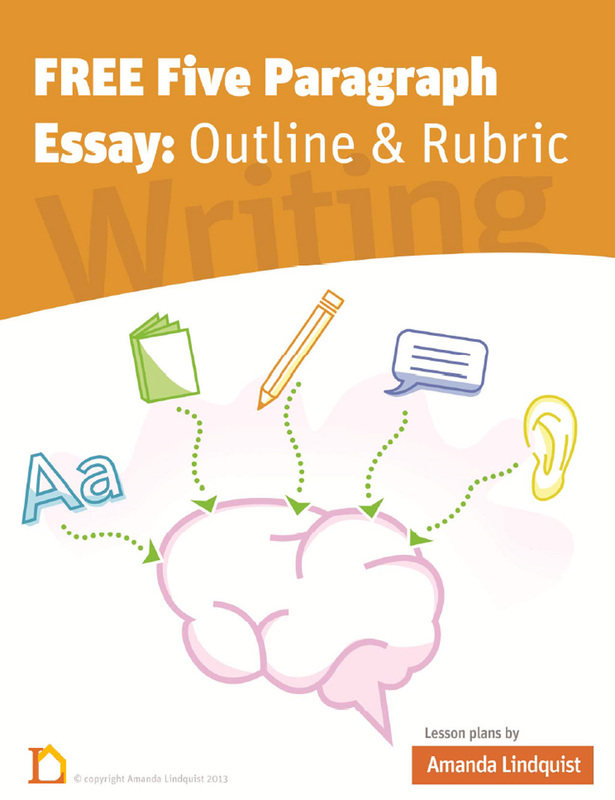 First, you've got your 5-paragraph essay rubric. I know in some districts the 5-paragraph essay is equivelant to a swearword now, but in all seriousness, it is useful in some cases. The key is getting students to understand that they will write different lengths depending on the subject at hand. 5-paragraphs tended to be a happy medium in which they would introduce, support for three paragraphs, and conclude. Eh, to each their own, but if you're district is against the 5-paragraph essay, just write in the directions that they need "as many body paragraphs as necessary to address the issue." That usually does the trick. Anywho, so the rubric is a great tool. However, most students don't understand it on their own and generally don't even look at it unless the teacher makes them. This is where you come in. Be sure to go over each section of the rubric and be clear that they are choosing their grade based on the quality of their work. If they want an A, then they need to meet all of the requirements under "4". After students have some research and background knowledge, they are ready to work on the outline. This is a great way to see if students have a grasp on their topic yet, or if you the teacher need to intervene. They organize their ideas and plan their paper. This outline is a guide to their paper, but it can certainly change as they do more research or start writing out their full ideas. I tell students that they don't have to worry about writing in complete sentences for this graphic organizer, but are welcome to if they perfer that style. When they feel that they have adequately finished their outline, they should conference with you or turn it in so you can look over it during prep (i.e. at home while you're trying to simultaneously make supper, clean the house, raise a family, and maintain some semblance of sanity... hehe). Once a student has earned your approval, they should continue on to the drafting, editing, and revising stages. Day 1 - Go over the rubric and expectations. Maybe have an exit ticket on which the student needs to list the basic requirements for their essay. Days 2 to 5 - As students start working on their research, refer to the rubric and make sure everyone has their rubric with them. If they ask a question about requirements, direct them to the rubric; if the rubric doesn't address their question, tell all of the students to write it down. Days 6 to 7 - After they've had a few days to research, they should start working on their outline. 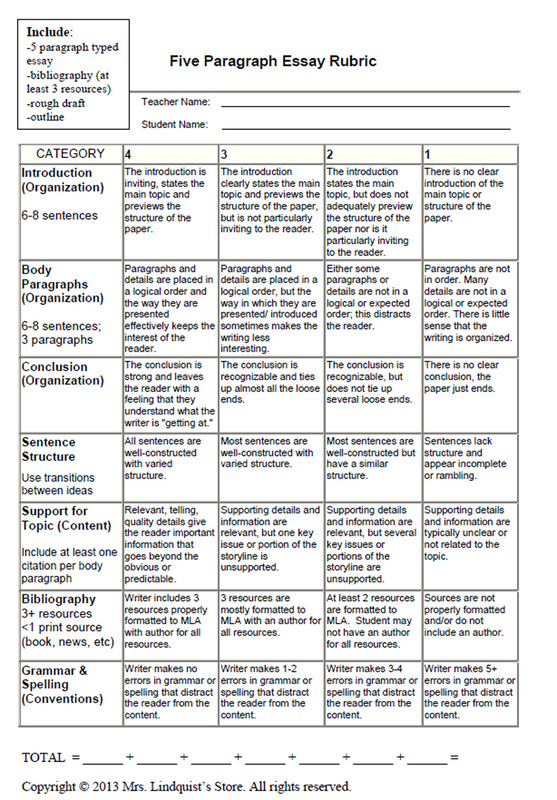 Again, the rubrics need to be out and students should be encouraged to refer to them at all times. Day 8 - Once students finish their outlines, they should conference with the teacher or turn it in to be approved. This is a GREAT time to catch any students who just aren't getting it yet. Day 9 and on - Draft the paper using the graphic organizer outlines to guide their writing. Then edit and revise (both with a peer and with the teacher). Finally, publish and present. I've developed this process over the last four years and have had great success with it. My students writing became less and less frustrating to read as I was able to guide them through the process more efficiently and they figured out what they needed to do. You won't regret using these tools to help improve student writing!